Cyanobacteria have attracted significant attention as potential biocatalysts for production of clean energy and green chemicals from sunlight and atmospheric CO2. A recent study investigated effects of altering large cellular complexes called phycobilisomes, which cyanobacteria use to efficiently capture light energy for photosynthesis, to guide development of optimal strategies for biofuel production. The findings revealed changes to phycobilisome structure indirectly affect critical, wide-ranging pathways in metabolism and other core cellular processes, beyond light harvesting and photosynthesis. 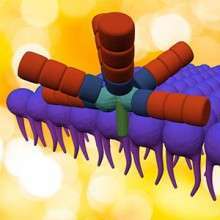 Although altering the structure of phycobilisomes might improve the efficiency of energy capture for biotechnology applications, these efforts could come at the cost of reducing the ability of the mutant cyanobacteria to carry out basic cellular functions. Photosynthetic organisms such as plants, algae and certain bacteria harvest solar energy and use CO2 to generate many valuable products essential for survival of all organisms, including humans. As photosynthetic bacteria, cyanobacteria are unique because they use phycobilisomes for highly efficient light capture, have minimal growth requirements and are readily amenable to genetic modification. As such, cyanobacteria provide distinct advantages over other prospective candidates for bioenergy production. However, synthesis and maintenance of these large phycobilisome structures is energetically demanding for the cell. Some scientists have proposed truncating or removing the phycobilisome structure could improve its efficiency in biomaterial production for biotechnology applications. However, broader effects of this bioengineering strategy on diverse cellular processes have remained unexplored. As part of EMSL's Synthetic Biology Research Campaign, which uses synthetic biology to probe molecular machines in photosynthesis, researchers from Washington University and EMSL, the Environmental Molecular Sciences Laboratory, addressed this question by studying proteomes of three cyanobacteria mutant strains with various degrees of phycobilisome truncation. The researchers used high mass accuracy liquid chromatography tandem mass spectrometry platforms at EMSL, a DOE Office of Science user facility, to obtain deep quantitative identification of the mutant cyanobacteria proteome. This analysis revealed 841 proteins showed dramatic changes in abundances among the mutant strains. Even minor changes in light-harvesting capability in the mutant with the least severe phycobilisome truncation had a cascade effect on wide-ranging cellular processes, including use, regulation and membrane transport of cellular resources such as iron, nitrite/nitrate and bicarbonate. Moreover, the total loss of the phycobilisome structure in the most severe mutant significantly interfered with most of these cellular processes. The findings demonstrate phycobilisome structures are critical to efficient cell and membrane transport functions, and alterations to these cellular complexes have far-reaching and unpredictable consequences. Therefore, efforts to directly truncate the phycobilisome to improve the efficiency of light energy capture might impair metabolic function and other vital cellular processes in mutant strains.